مشتاقی یزدانی, نوید, محجوب, محمد. (1396). بررسی مقایسه‌ای کارایی روش‌هایی بر پایة تکنیک‌های هوش مصنوعی در تشخیص عیوب سیستم‌های مکانیکی. مجله صوت و ارتعاش, 6(12), 41-56. نوید مشتاقی یزدانی; محمد محجوب. "بررسی مقایسه‌ای کارایی روش‌هایی بر پایة تکنیک‌های هوش مصنوعی در تشخیص عیوب سیستم‌های مکانیکی". مجله صوت و ارتعاش, 6, 12, 1396, 41-56. مشتاقی یزدانی, نوید, محجوب, محمد. (1396). 'بررسی مقایسه‌ای کارایی روش‌هایی بر پایة تکنیک‌های هوش مصنوعی در تشخیص عیوب سیستم‌های مکانیکی', مجله صوت و ارتعاش, 6(12), pp. 41-56. مشتاقی یزدانی, نوید, محجوب, محمد. بررسی مقایسه‌ای کارایی روش‌هایی بر پایة تکنیک‌های هوش مصنوعی در تشخیص عیوب سیستم‌های مکانیکی. مجله صوت و ارتعاش, 1396; 6(12): 41-56. بلبرینگ‌ها یکی از پر استفاده‌ترین قطعات موتورها می‌باشند که به دلیل چرخش دائمی زودتر از بقیه قطعات دچار خرابی می­شوند و بدین خاطر تحقیقات وسیعی بر روی پایش سلامت بلبرینگ‌های موتورهای القایی انجام شده است. عیوب بلبرینگ‌ها معمولا از نوع محلی هستند که در حلقه داخلی، خارجی، ساچمه‌ها یا قفسه ایجاد می‌شوند. به همین علت از سیگنال ارتعاشی برای پایش سلامت بلبرینگ‌ها استفاده می‌شود. همچنین در این پژوهش عیب‌یابی ورق‌های کامپوزیت با استفاده از پردازش سیگنال ارتعاشی و روش‌های مبتنی بر هوش مصنوعی نیز صورت گرفته است. سیگنال‌های ارتعاشی از ورق‌های کامپوزیتی سالم و دارای عیب گرفته شده و با استفاده از روش‌های مختلف پردازش سیگنال حوزه زمان- فرکانس تعدادی ویژگی از این سیگنال‌ها استخراج شده است. سپس موثرترین ویژگی‌ها که حاوی اطلاعات بیشتری از ورق‌های کامپوزیتی می‌باشند به‌عنوان ورودی به سیستم‌های مختلف طبقه‌بندی داده شده است که خروجی آنها نشان‌دهنده نوع و شدت عیب می‌باشد. نتایج به‌دست آمده نشان‌دهنده برتری روش انفیس[i] از نظر درصد دقت می‌باشد درحالی‌که این روش بیشترین مدت زمان اجرا را در تعداد اجراهای برابر دارد. درصورتی‌که روش پیشنهادی XCS بهبود یافته است، درصد دقت نسبتا کمتری نسبت به انفیس دارد، ولی مدت زمان اجرای کمتری را (در تعداد اجرای برابر نسبت به روش فوق) به خود اختصاص می‌دهد. Sohn, M.S, Hu .X.Z, Kim J. K and Walker.L, "Impact damage characterization of carbon fiber /epoxy composites with mlti-layer reinforcement", Composites:Part B, vol31, 2000, pp.681-69. Chen C. and C. Mo: “A method for intelligent fault diagnosis of rotating machinery”, Digital Signal Processing, vol.14, 2004, pp.203–217. Raﬁee, J., M.A. Raﬁee, and P.W. Tse: “Application of mother wavelet functions for automatic gear and bearing fault diagnosis”, Expert Systems with Applications, vol.37, 2010, pp.4568–4579. Goddu, G., B. Li, M.Y. Chow, and J.C. Hung: “Motor Bearing Fault Diagnosis by a Fundamental Frequency Amplitude Based Fuzzy Decision System”, IEEE Industrial Electronics Society Conference, vol.4, 1998, pp.1961-1965. Zio, E. and G. Gola: “A Neuro-Fuzzy technique for fault diagnosis and its application to rotating machinery”, Reliability Engineering & System Safety, vol.94, no.1, 2009, pp.78–88. Song, O., T. W. Ha, and L. Librescu, “Dynamics of anisotropic composite cantilevers weakened by multiple transverse open cracks,” Engineering Fracture Mechanics, vol.70, no.1, 2003, pp.105–123. Just-Agosto, F., D. Serrano, B. Shaﬁq, and A. Cecchini, “Neural network based nondestructive evaluation of sandwich composites,” Composites B, vol.39, no.1, 2008, pp.217–225. Perera, R., A. Ruiz, and C.Manzano, “Performance assessment of multicriteria damage identiﬁcation genetic algorithms,” Computers and Structures, vol.87, no.12, 2009, pp.120–127. Friswell, M. I., J. E. T. Penny, and S. D. Garvey, “A combined genetic and eigensensitivity algorithmfor the location of damage in structures,” Computers and Structures, vol.69, no5, 1998, pp.547-556. Fang, X., H. Luo, and J. Tang, “Structural damage detection using neural network with learning rate improvement,” Computers and Structures, vol.83, no.25-26, 2005, pp.2150–2161. Beena, P. and R. Ganguli, “Structural damage detection usin fuzzy cognitive maps and hebbian learning”, Applied Soft Computing Journal, vol.11, no.1, 2011, pp.1014–1020. Kuo, H. C. andH. K. Chang, “A new symbiotic evolution-based fuzzy-neural approach to fault diagnosis of marine propulsion systems,” Engineering Applications of Artiﬁcial Intelligence, vol.17, no.8, 2004, pp. 919–930. Wang, W. Q., M. F. Golnaraghi, and F. Ismail, “Prognosis of machine health condition using neuro-fuzzy systems”, Mechanical Systems and Signal Processing, vol.18, no.4, 2004, pp.813–831. Pawar, P. M. and R. Ganguli, “Genetic fuzzy system for online structural health monitoring of composite helicopter rotor blades,” Mechanical Systems and Signal Processing, vol.21, no.5, 2007, pp.2212–2236. 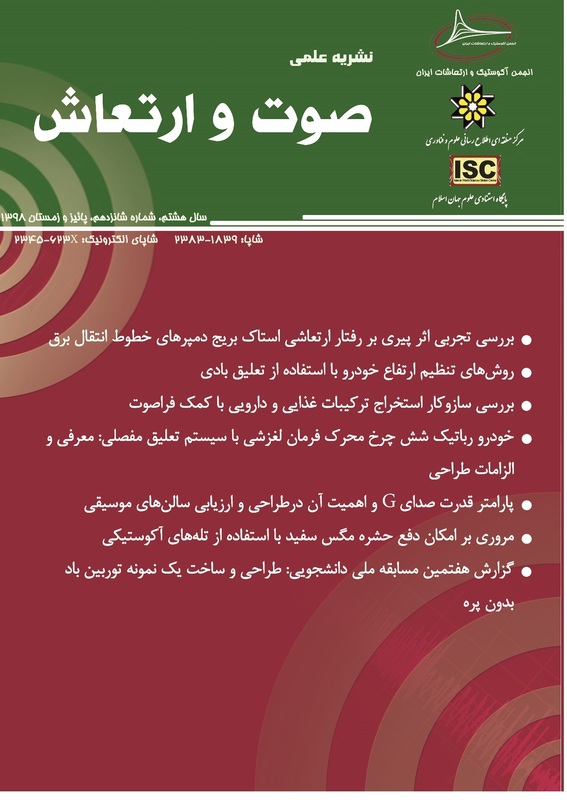 ShariatPanahi, M., N.MoshtaghiYazdani, “An Improved XCSR classifier system for data mining with limited training samples”, Global Journal of Science, Engineering and Technology, Issue.2, 2012, pp.52-57. Thomson, W. T., “A review of on-line condition monitoringtechniques for three-phase squirrel cage induction motors Past present and future,” IEEE SDEMPED’99, Spain, 1999, pp.3–18. Nandi, S., H. A. Toliat, X. Li, "Condition monitoring and fault diagnosis of electrical motors-A Review," IEEE Transactions on Energy Conversion, vol.20, no.4, 2005, pp.719-29. Farrar, C. R., S. Doebling and C. R. Prime, “A summary review of vibration-based damage identification methods” The Shock and Vibration Digest, vol.30, no.2, 1998, pp.91-105. Thomson, W. T., “A review of on-line condition monitoring techniques for three-phase squirrel cage induction motors— Past present and future,” IEEE SDEMPED’99, Spain, 1999, pp.3–18. Tandon, N. and A. Choudhury, “A review of vibration and acoustic measurement methods for the detection of defects in rolling element bearings,” Journal of Tribology International, vol.32, no.8, 1999, pp.469-480. Singh, G.K., Sa’ad Ahmed Saleh Al Kazzaz, “Induction machine drive condition monitoring and diagnostic researcha survey,” Journal of electric power research, vol.64, 2003, pp.145-158. Benbouzid, M. E. H., “A review of induction motors signature analysis as a medium for faults detection,” IEEE Trans. Industrial Electronics, vol.47, no.5, 2000, pp.984-993. Benbouzid, M. E. H., “What stator current processingbased technique to use for induction motor rotor faults diagnosis?” IEEE Trans. Energy Conversion, vol.18, no.2, 2003, pp.238-244. Lebold, M.; McClintic, K.; Campbell, R.; Byington, C.; Maynard, K. “Review of Vibration Analysis Methods for Gearbox Diagnostics and Prognostics”, Proceedings of the 54th Meeting of the Society for Machinery Failure Prevention Technology, Virginia Beach, VA, May 1-4, 2000, p. 623-634. Yazici, B., G. B. Kliman, “An adaptive statistical timefrequency method for detection of broken bars and bearing faults in motors,” IEEE Trans. On Industry App., vol.35, no.2, 1999, pp.442-52. Nikolaou, N.G., I.A. Antoniadis, “Rolling element bearing fault diagnosis using wavelet packets,” Journal of NDT & E, vol.35, Issue.3, 2002, pp.197-205. Prabhakar, S., A. R. Mohanty, A. S Sekhar, “Application of discrete wavelet transform for detection of ball bearing race faults,” Journal of Tribology International, vol.35, no.12, 2002, pp.793-800. Eren, L., J. Devaney, “Bearing Damage Detection via Wavelet Packet Decomposition of the Stator Current,”IEEE Trans. On Instrumentation and Measurement, vol.53, no.2, 2004, pp.431-6. Polikar, R, “Ensemble based systems in decision making”, IEEE circuits & systems magazine, vol.6 no.3, 2006, pp.21-45.